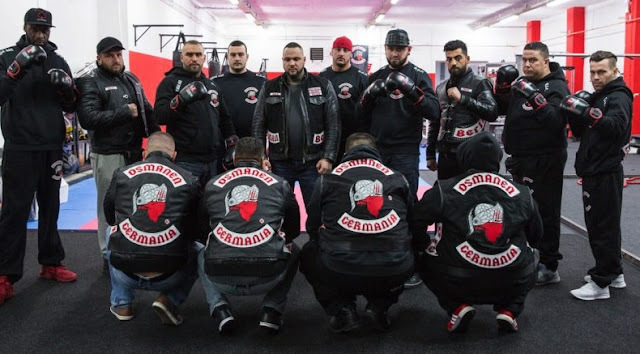 BUTLINCAT's BLOG: DAFT: "“We Are Coming And We Will Take Your Country” Muslim Biker Gangs And Boxing Clubs Training To Take Over Germany"
DAFT: "“We Are Coming And We Will Take Your Country” Muslim Biker Gangs And Boxing Clubs Training To Take Over Germany"
Please help our independent conservative journalism by spreading this article! Share! 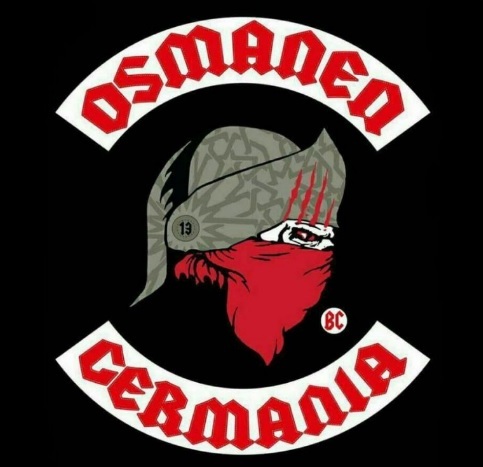 Save German Muslims have established a self-styled biker gang, Germany’s Muslims, which is said to be modeled on the Hells Angels and aimed at protecting fellow Muslims from the “ever-growing hatred of Islam,” according to Die Welt. According to gatestoneinstitute.org: The emergence of the group, which aspires to open chapters in cities and towns across Germany, has alarmed German authorities, who have warned against the growing threat of vigilantism in the country. The gang’s uniform consists of a black leather jacket with a logo depicting a one-fingered salute, the “Finger of Tawheed,” which represents belief in the oneness of Allah. The logo also includes the number 1438, which represents the current year in the Muslim calendar, as well as the number 713, which stands for GM (Germanys Muslims), the seventh and thirteenth letters of the alphabet. Police say they do not know how many people belong to the gang, which was established in May. Although “Germanys Muslims” claims to disavow violence, police say that several of its senior members are known to be Salafists, whose aim is to replace liberal democracy in Germany with Sharia law. One of its members, for instance, was detained as a security precaution during the Tour de France, which passed through Mönchengladbach on July 2. German police describe the group’s founder, Kunst, as an “Islamist who moves in Salafist circles.” In a video that is no longer available, Kunst called on the group’s members to protect mosques and Muslim women. In a July 27 interview with Die Welt, Isabella Hannen, spokeswoman for the Mönchengladbach Police Department, revealed that police met with Kunst on July 5 and warned him that “vigilantism will not be tolerated.” They also stressed that the monopoly on the legitimate use of physical force (Gewaltmonopol) is the exclusive domain of the state. On July 28, “Germanys Muslims” issued a statement saying that the group respects the authority of the state. “So far, we have no evidence that they are a danger, but we are keeping our eyes on them,” Hannen said. Read more at http://www.projectrepublictoday.com/2017/08/02/coming-will-take-country-muslim-biker-gangs-boxing-clubs-training-take-germany/ .